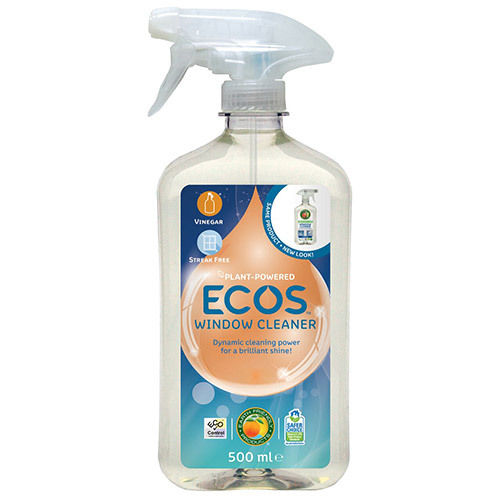 Let the light shine more brilliantly with ECOS` streak-free Window Cleaner. Formulated to clean quickly without ammonia for brighter glass, mirrors and surfaces. Vegan, cruelty free and carbon neutral. Water, Denatured Alcohol, Acetic Acid and <5% non-ionic surfactants. Spray on surface to be cleaned. Wipe dry with a paper towel or soft cloth. Use sparingly, a little goes a long way. DO NOT mix with chlorine type bleaches, chemical or any other cleaners. Below are reviews of ECOS Window Cleaner - Vinegar - 500ml by bodykind customers. If you have tried this product we'd love to hear what you think so please leave a review.